Thing No. 1. Rejoice. Harry is here. Harry arrived without fanfare several months ago from London. He came on British Airways, hoping to avoid the fate of his older brother, Simon, who came on United a couple of years ago and who unfortunately died at O’Hare Airport, perhaps when someone locked him in a freezer. There was no autopsy, so no one really knows how Simon died. 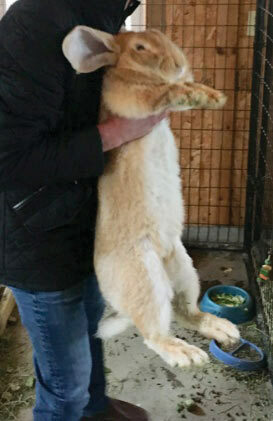 Simon was, until he died, on his way to becoming the world’s largest rabbit, roughly the size of a third-grader. He was the son of Darius, the world’s largest rabbit at 4-feet 2-inches long from nose to hind foot, and the brother of Jeff, who, since the untimely death of Simon, now vies with Darius for the title of largest living rabbit. Harry is still a youngster and still has a lot of growing to do. So who knows? The arrival of Harry follows settlement of a lawsuit involving the death of Simon. Simon had been purchased for $2,330 (including shipping) from a breeder in England by Mark Oman and Duke Reichardt and Steve Bruere. They hoped to show him at the Iowa State Fair — he was all but assured to win the biggest-rabbit title — and then use him as a lovable prop to raise money for the fair’s Blue Ribbon Foundation. But he never made it out of the freezer. The lawsuit asked for their costs, reimbursement for money Simon and Simon-related products would have earned, and punitive damages. Lawyer Guy Cook filed the suit in state court, but United successfully got the suit moved to federal district court here, perhaps so the case would fall under the Montreal Convention, which deals with victims of air disasters. Thing No. 2. The trial of Marty Tirrell, originally set for April Fools’ Day, has been put off until Sept. 9 at the request of the Federal defender appointed to represent the sports-talk host and serial scammer. Tirrell, who was jailed after being arrested by the FBI on Feb. 13, now is out of prison on pretrial release. Terms of that release have been sealed. The 59-year-old broadcaster was indicted by a grand jury and charged with mail fraud, two counts of wire fraud, two counts of bank fraud and fraudulent use of another person’s credit card. The charges carry prison sentences of up to 30 years and fines of up to $1 million. Over the past several years, state and federal courts have regularly found that he fleeced friends and customers and employers and listeners. Many of his schemes involved getting those folks to put up thousands of dollars — up to $1 million — so they could partner with him in various schemes. Several times, he promised to use the money to buy blocks of tickets to major sporting events, promising he’d repay the lenders and split with them the profits on the resale of the tickets. They never saw their money again — and sometimes never saw Tirrell again. He has several millions of dollars of judgments against him. So it’s a pretty good bet the criminal case will be settled before trial (as 90 percent of federal criminal trials are). One way: the government could drop many charges in return for a guilty plea on one or two of them. The government then could recommend a sentence for Tirrell, though that sentence ultimately will be up to Federal Judge Stephanie Rose, who will consider — but not be bound by — federal guidelines. Rose used to be a federal prosecutor, which does not necessarily bode well for Tirrell. Some defense lawyers queried by CITYVIEW guessed Tirrell would be sent to a medium-security prison for five to eight years. There is no parole for federal offenders, though prisoners can get their sentences reduced by up to 15 percent for good behavior. Thing No. 3. Nyemaster Goode, the firm now defending Gov. Kim Reynolds, former Gov. Terry Branstad and four persons in his administration in the lawsuit filed by Chris Godfrey, just sent the state another bill. This one is for $30,719.92. That puts the cost to taxpayers — so far — at $1,309,598.42, by CITYVIEW’s reckoning. Godfrey, the former head of the Iowa Workers Compensation department, sued for defamation, discrimination and retaliation after Branstad tried to fire him and then, when that didn’t work out, cut his pay. The pay cut totaled about $150,000 over the four years that remained in Godfrey’s term. Godfrey, first appointed by Gov. Tom Vilsack and then reappointed to a six-year term by Gov. Chet Culver, is gay and a Democrat, two characteristics that apparently didn’t sit well with Branstad. The state originally was represented by the LaMarca firm, but Nyemaster took it over about $300,000 ago.